Welcome to part 1 of Whispers from the Past. Hi, do you have your hook and yarn at the ready? The first part of this cal is named in honour of my Nana, Winifred. 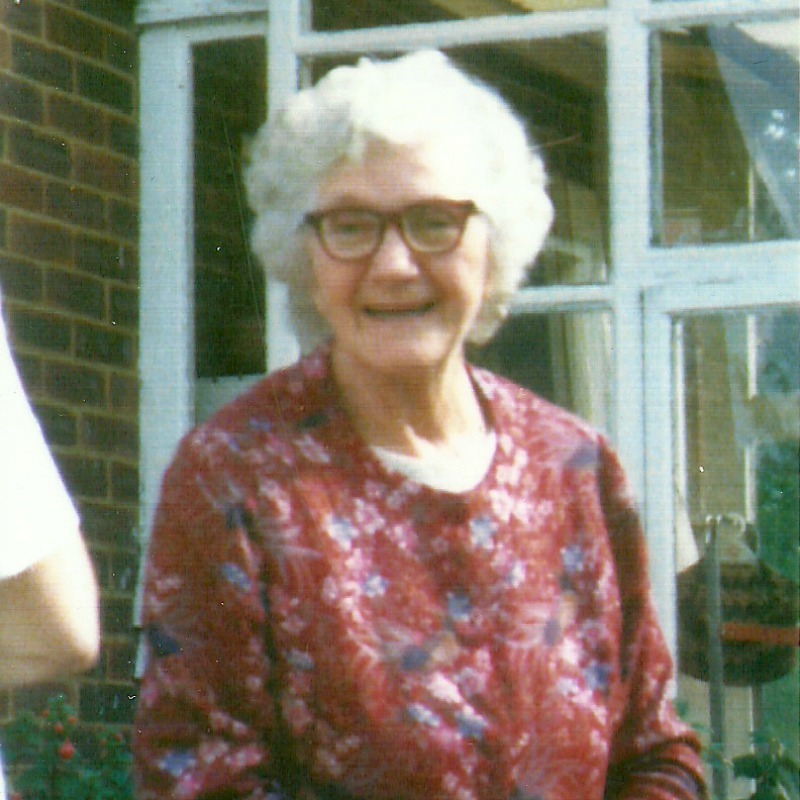 She taught me how to crochet when I was a little girl. When I was little, I used to spend a lot of time with my Grandparents, it was a way for me to escape from the noise and chaos of busy family life. I have always been a soul that needs peace and tranquillity. My Nana used to have crocheted throws over the back of the sofa, and often if I was in need of a hug, that is where we would sit, snuggled up in one of her amazing blankets. 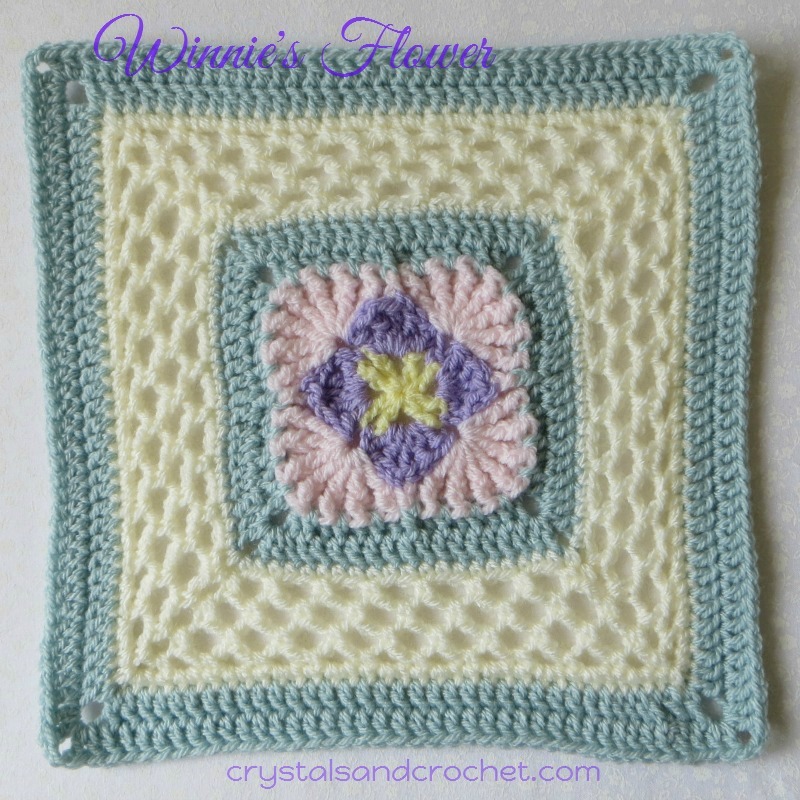 She used to use a very simple four petal flower, made with double and treble crochet stitches, which is what the centre of this week’s square is based on. Winnie’s square is named after this amazing lady, who was incredibly talented and creative. She loved looking after her family, baking, crafting and gardening, she was a sweet, reserved soul, who I know still watches over me. Here is a little photo of her. So I would like to share with you, my memories of fun, love, and lots of hugs, all wrapped up in Winnie’s Square. You will need to make 4 squares. My personal preference, is to make all 4 of each round, before moving on to the next round. The reason for this is to ensure that your tension and gauge is consistent throughout your work. Also it is easier to remember the repeat for each round as you go, rather than having to constantly refer back to the pattern. ♥ Front post stitches video tutorial. Back loop stitches video tutorial. Just click on either of the links and it will take you to a short video tutorial, with some handy hints. 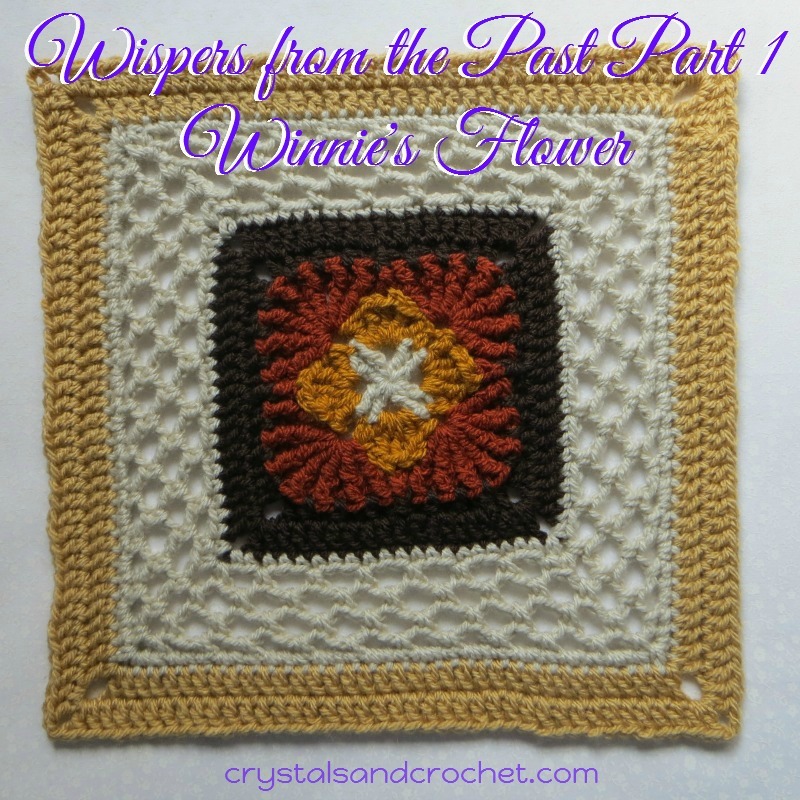 ♥ Winnie’s Square Video Tutorial. Including instructions on blocking, so this is a long one! Join to 3rd ch, fasten off, and secure ends. Stitch count: 8 dc, 4 ch 1 spaces. Repeat from *to * 4 times, omit last sc. Stitch count: 4 sc, 4 shells of 5 tr plus 4 ch-1 spaces. Hint: In this round you will work only in the 3rd tr of each shell and the sc between shells. Repeat from * to* 4 times, omit last blsc. Stitch count: 4 blsc, 4 shells of 7 tr plus 6 ch-1 spaces. Repeat from * to * 4 times, omit last fpdc. Join to 1st fpdc, fasten off, and secure ends. Stitch count: 32 fpdc, 24 ch-1 spaces. Hint: this round is worked behind R4 into sts from R3 and in R4. Stitch count: per side: 6 hdc, 1 fphdc, 8 dc. Stitch count: per side: 19 dc. Stitch count: per side: 21 sc. Hint: sides are not symmetrical, there is no ch-3 at the end of each side. Stitch count: per side: 9 sc, 7 ch-3 spaces. Hint: the next 3 rounds are worked into the chain spaces only. Stitch count: 9 sc, 8 ch-3 spaces. Stitch count: per side: 10 sc, 9 ch-3 spaces. Stitch count: per side: 11 sc, 10 ch-2 spaces. Join to 1st sc, fasten off and secure ends. Stitch count: per side: 34 sc. Stitch count: per side: 36 dc. Stitch count: per side: 40 dc. Your squares will need blocking at this point, to open up the mesh, and to make joining easier. DO NOT JOIN! Depending on the yarn you are using, you may prefer to either wet block or steam block. Important: do not over stretch the solid parts of your square, they should remain neat and compact. Approx. 4 ½ inches Dk with 4mm hook, or 5 ½ inches with Aran and 5.5mm hook. or 12 inches with Aran/Worsted and 5.5mm hook. Spray with water, or blast with steam (ensuring you do not touch the yarn), leave to thoroughly dry. I love this CAL, I chose the brown sugar color pack from Deramores. The dark brown matches my sofa perfectly and I am so looking forward to seeing this Afghan on my sofa. Your imagination and skill in making patterns so easy to understand is awesome. Thank you. Hello Helen Thanks for beautiful crocheted things you give us here. But I wonder… Can it be on Norwegian to how to do the crochet? Thanks. Another beautiful project 🙂 Thank you Helen. Just beautiful! I read the pattern through and, as usual, your pattern is easy to understand. Thank you for this CAL.